MODERN ANDROID APPLICATION ARCHITECTURE DEVELOPMENT: Part 3 – Dependency Injection, RxJava, DAO’s and more! In continuation of the series of posts with our friends on the Nordstrom Technology team we’re going to be furthering our development of our Stackoverflow client. Let’s begin by looking at our main activity (StackRXActivity). The activity houses our drawer layout and basic functionality. It’s important to abstract as much out of the main activity as possible as they tend to become large and unwieldy. In the main activity we see our first appearance of dependency injection. This injection annotation sets our content view within the main layout. 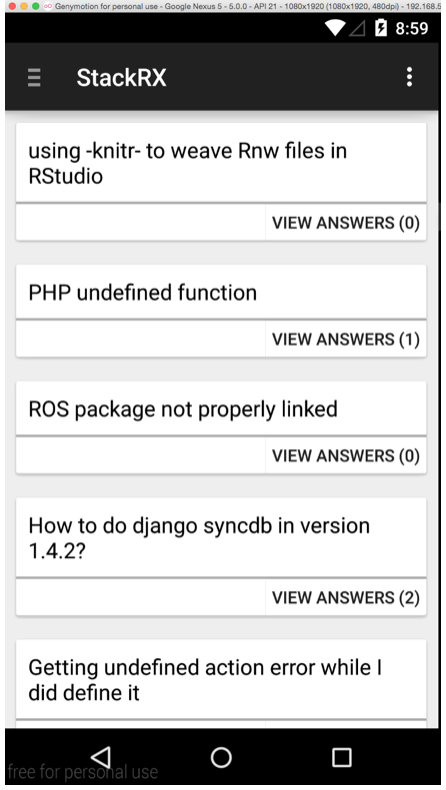 Our main activity now loads our first fragment and displays a list of StackOverflow questions. Let’s take a look at QuestionFragment. The question fragment is added onto the fragment stack and utilizes a mixture of RXJava and Retrofit to load the content into a RecyclerView. If you haven’t used Androids new RecyclerViews they were introduced as a new component in Lollipop. RecyclerView’s are essentially a replacement to the classic ListView but with added functionality (such as being able to scroll horizontally or vertically) and with increased performance. For more information check out Creating Lists and Cards. The RecyclerViews enforce the view holder pattern. RxJava is an excellent way to address many problems associated with Asynchronous tasks and is rapidly being adopted in many Android projects. We’ll primarily use it to interact with our service layer. For more information check out the RxJava documentation. We’ll deep dive Rx in Part 4: More RxJava, Adapters, Unit Testing and More! This is a clean way to separate the UI and data layers. The DAO calls simply wraps the Retrofit service calls which return a Observable as a result. Retrofit is a library by SquareUp. Retrofit easily allows you to do a network call and marshall the data via GSON into objects. That’s it! 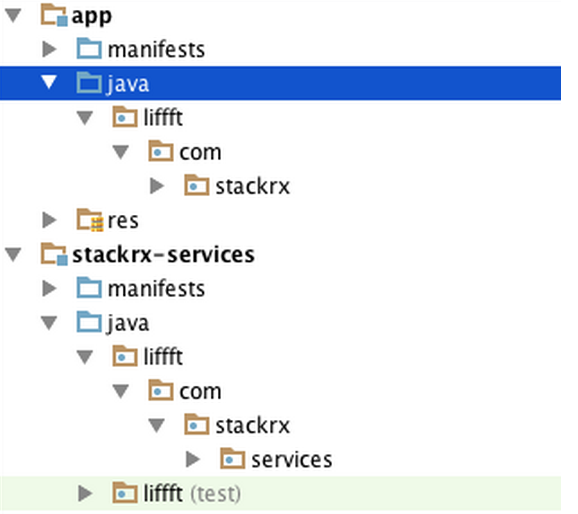 If you want to see the code behind the Retrofit call check out BaseService.java in the services project. Once executed we receive the response back to our observer that lives in the QuestionFragment class. Be sure to select ‘JSON’ as the type and GSON as the source type. Download the jar, unzip, and wha-la add it to your project. These generated files should never be changed, any business logic should live in your view layer. Each call is added to a composite subscriber which lives in the BaseFragment. When an fragment is destroyed all the RxJava observers are released. Next we execute the service call. Note we use AndroidSchedulers this is actually part of the RxAndroid project and should be included in the build gradle. onNext – This is receiving the signal from an Observable. This is essentially our successful call. The question class mirros the JSON response in a series of Question objects. Finally we set our item list in our adapter and update. onError – This returns out error call. Typically a RetrofitError is returned this contains the server error and any additional information. onComplete – This is logically called when completed. This is a good place to hide loading indicators etc. Note: If onError is called, Retrofit does not call onComplete. Finally we have a concept of a user session. The user session is adopted from the web world. The typical way of passing around data in Android is either using the bundle or creating a new instance of a fragment and setting local variables, ugh. Our user session is a singleton that can be used throughout the application. We then inject the singleton into future fragments that require it. The UserSession object is powerful but be aware of it’s contents may be changed throughout the app. Stay tuned for Part 4: More RxJava, Adapters, Unit Testing and More! Thanks for reading. If you have any questions or would like to know more about working with the Nordstrom Technology team feel free to shoot us an email! 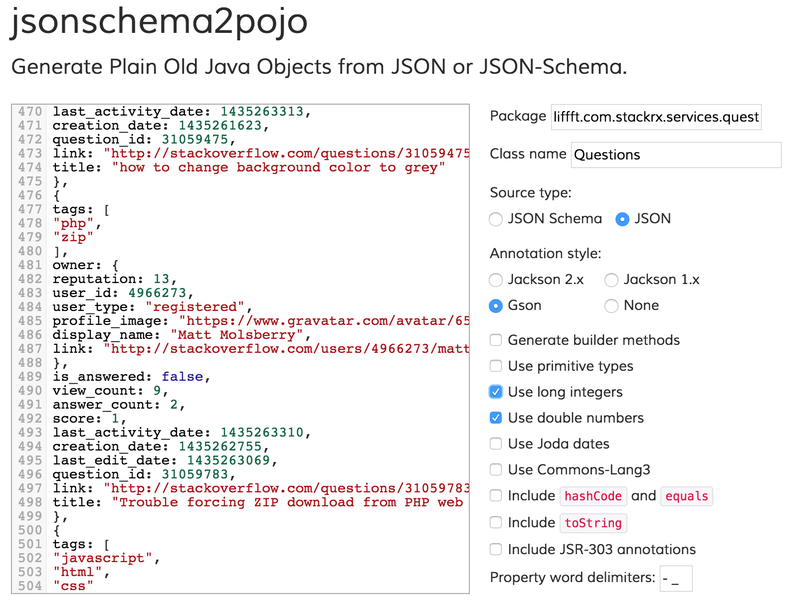 In continuation of the series of posts with our friends on the Nordstrom Technology team we’re going to be creating a simple StackOverflow client utilizing the technologies discussed in Part 1 – Tools & Libraries. The image to the right is the final screen that will be presented to the user. Before we jump into code let’s take a look at the anatomy and organization of the project. As mentioned in Part 1 we completely decouple the service layer from the view layer. Projects that combine these become extremely unwieldy, limit code reusability and are much harder to test. Android specific logic will never exist within the service layer. Keep in mind that another team may use the service layer for their project so keep it clean. The services build.gradle should include any libraries shared between the application front-end and the services layer. Notice how we have the new Material Design cardview library only in the app dependencies but the services library contains Roboguice which is used both in the services and app. Android applications are often organized by object type but we organize by feature. As projects get more complex, standard naming is imperative. As we progress in the project development you will notice that all packages resemble each other in both the unit tests, client code and service layer. This prevents problems like a fragment package with 30 fragment files with no context or classes being in packages for no rhyme or reason. Coming into a large Android project can be hell. As a new developer getting your first commit can be overwhelming. However if the application is broken into features it’s much easier to get started. Need to make changes to the shopping page? Most likely it will be in the shop->fragment package. Some oversight will be needed for shared objects. We will touch on this further, but fragment classes should be as small as possible. Complex things such as adapters should be moved into their own packages and classes when possible. This leads to more testable code in general. Let’s Write Clean Code Together. Android Code Best Practices. We’ve spent a lot of time thinking of ways to keep our code base as uniform and readable as possible. Following good practices from day #1 will reduce code complexity, tech debt and refactoring time. Many projects race to release but are so disorganized and non-uniform a rewrite is almost necessary afterwards. 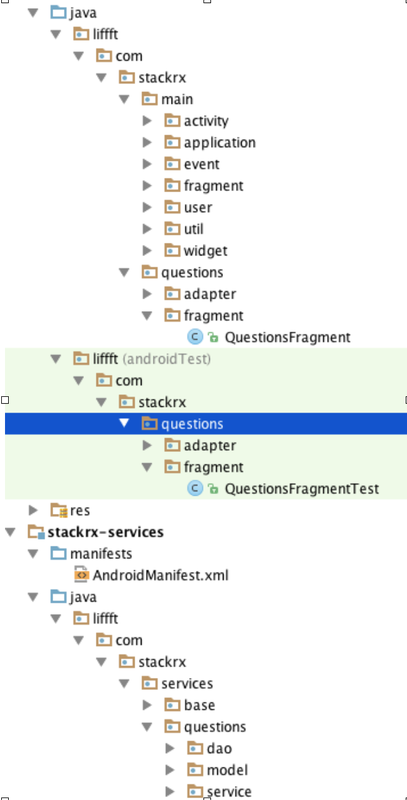 Android Studio supports regions; a little known feature that really helps organize classes. The categories above are the same for every fragment, adapter, activity etc. This won’t be crystal clear initially, but I’ll explain each region and its purpose. Local class variables. We tend to perserve the ‘m’ prefix. Widget is used as a catch-all for widgets within the screen. Listeners should always be separate classes and never be inline in the life cycle methods. Also set the listener in the code and never implement or extend on the class level. Let Android Studio name your variables for you! Rather than using a shorthand like "adaptor" or "qda" for a “QuestionDetailAdapter” simply start typing the first letter of the class name to have it automatically named that. We use the m prefix on all class level variables. While this is always up for debate, you never have any of the time wasting this.variableName on constructors. context = context;      // no! mContext = context;  // nice! The layout name always matches the class exactly. This makes it is incredibly clear which layout file is for which class. Variable naming should always match the layout name appended with what it is and its type. Do you have any other tips / tricks for keeping your project sane and beautiful? Drop us a comment! Stay turned for Part 3: Dependency Injection, RxJava, DAO’s and more! In continuation to our series of posts with our friends on the Nordstrom Technology team we’re going to take a detour from RxJava and start looking at modern application architecture. Android development has changed significantly since we first started developing applications circa 2009. Typically the build system was Ant, (Maven if you were adventurous and really wanted package management), the IDE was Eclipse and the language was of course Java. The emulator was, until only recently, laughably bad. Android library support was still evolving. Simple tasks like talking to a JSON backend and presenting data was painful. // onPostExecute displays the results of the AsyncTask. Who remembers, and who still does, a GET request like this? It’s huge and we haven’t even marshalled the data into objects yet! Fortunately things have been evolving especially after Google introduced Android Studio and Gradle as their defacto environment. Libraries have made our lives infinitely easier and tooling has gotten significantly better. However, a lot of projects are still being built as if it was five years ago. Now I don’t blame developers for this. Android, unlike iOS, has a ton of options to choose from, and there is often no clear direction from Google. Even some of Google’s own libraries; Volley, a solution for Async networking, for example; are poorly advertised. Android often feels it is plagued by JQuery syndrome. There are a thousand ways to do something, but what works best? In this series of blog posts we’ll build a real life application that uses what we feel is the best architecture/technology to achieve robust and well made apps. We’ll focus on building a pretty typical client server application piece by piece. As previously mentioned Android Studio and Gradle are now the recommended development environment for Android. If you’re still considering using Eclipse for a new project it’s unsupported. Frankly it’s time to get used to Android Studio. We would still recommend sticking to Java due to the wealth of information currently out there. In our project we’ll slowly migrate to use RetroLambda to reduce the verbosity of our code. Having a build server such as Jenkins will make managing builds in any environment that much simpler. A good alternative is Travis if you don’t want to spin up your own infrastructure. What Android versions should you support? It’s pretty safe to no longer support anything Ice Cream Sandwich (4.0) and below. 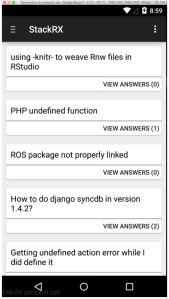 Version statistics are always available on the Android Developers Site. Having a good emulator is essential for rapid development, reducing build times and testing on different device configurations. Previously the Android default emulator was so poor that most developers just used physical devices. Google has finally released a decent emulator utilizing Intel’s HAXM technology. While it’s gotten better, we currently recommend Genymotion. Genymotion is fast, really fast. It’s free for personal development and simulates the most popular phones on the market today. It’s worthwhile to get yourself up to speed on Material Design and its principals. Any apps not adhering to the new Material Design will not be getting much love in the Play Store. Typically triggered by a user action (sign in button, displaying a list) We always break out the service layer apart from the view layer. Projects get ugly quickly when the view layer and service layers are intermixed. We’ll create a separate Android library to accomplish this. When a user needs to perform any action against our Restful backend we’ll call into the service layer. Not blocking the Android UI thread is critical to prevent Android from killing your app. Some of the major libraries used for this are Volley, Retrofit and Robospice. Each have their strengths and weaknesses. We chose Retrofit for a few reasons. Syntactically it’s very simple and Retrofit also plays well with RxJava which we’ll use to communicate with the view layer and beyond. Part 3: Dependency Injection, RxJava, DAO’s and more! will give a full example of this. Much more on this later. Once again there are a lot of alternatives for this. Some typical ones are Google HTTP Client and OkHTTP. We use OkHTTP as it’s also by Square and easily integrates with Retrofit. Note: The Apache HTTP libraries have been deprecated for some time now so stay away from them. In order to easily work with our data we want it returned as objects. A lot of projects still do this by hand and it’s painful and error prone. Common libraries to do this are Jackson and GSON. We will use GSON in our project. In order to present the data to the user we must get back the requested data in a useful form. Once again Volley, Robospice, Retrofit and various others all support this. We are using RxJava. RxJava is a reactive style of programming that is extremely powerful and solves a lot of problems other libraries do not. RxJava was originally developed for the .NET platform but has been ported to seemingly every language known to man. ReactiveCocoa for iOS is extremely popular. User Logs In -> Server Must Verify Username / Password -> User’s addresses, credit cards, and list of orders are returned from the server. Managing all these interactions is handled with RxJava in an elegant way. Also more on this later. An event bus is an easy way to communicate between fragments, activities etc. Android has a default event bus but the most popular is Otto by SquareUp. Event busses are a great way to communicate within the app but can be grossly overused. Used sparingly they solve a whole host of issues and reduce callback hell. We’ll use Otto in small doses. There are a host of image loading frameworks out there. The most popular include Picasso, Volley, Glide, and Universal Image Loader. Recently Facebook released Fresco. Fresco is a robust image library that uses an image pipeline to efficiently manage memory. This solved a host of memory problems in a recent app we were working on as it was extremely image heavy. Dependency injection helps manage inter-dependencies in the application. The most commons ones are Butterknife, Roboguice and Dagger. We use Roboguice as it’s less complex than Dagger and plays well with Mockito for our unit testing. We are currently investigating Dagger as a viable alternative now that it is supported by Google. Testing has traditionally been a pain in Android. More projects than not have no tests at all. Tools often don’t play well together and the Android lifecycle and Context often make testing difficult. Things have improved with better testing integration with Android Studio’s recent releases. Mock data is important. It allows you to manipulate data to easily perform varying tests. It also allows you to develop without being dependent on the service layer or making live calls. Common mocking frameworks are Mockito, Powermock and Easymock. For our project we’ll use Mockito as it plays well with Roboguice, RxJava and Espresso. We’ll test our business logic using straight, and fast, JUnit tests. The app must be structured in a smart way to truly make this achievable. Typically too much logic happens in Android’s lifecycle methods which makes testing extremely fragile. We’ll create helpers to test our business components. Numerous libraries allow for on device integration tests. These tests tend to be slower but are able to test both business logic and UI. The most common ones are Espresso, Robolectric (which is a headless JVM and does not require a device), and Robotium. For our project we’ll use Espresso. We chose Espresso as it’s maintained by Google and has good API’s. We’ve experienced a lot of compatibility problems with Robolectric and Robotium especially with new features added by Google. Want Whiteboard Wednesday videos, articles, and tutorials delivered straight to your inbox? Sign up for our mailing list.